The pine processionary, Thaumetopoea pityocampa (Den. & Schiff.) (Lepidoptera: Notodontidae), is an insect of Mediterranean origin. Its caterpillars develop in a gregarious way on pines, and possibly other conifers (cedars, Douglas fir, etc…), in colonies easily recognizable by their silky white nests, well visible in winter (Figure 1). The lethal temperature, below which not all processionary colonies can survive, has been estimated at -16°C, a value that is now very rarely reached in most parts of Western Europe. – The air temperature must be above 0°C during this night (supply temperature). This allows us to calculate the mortality and the number of nights that the caterpillars can feed during winter, and conversely the number of consecutive days of famine, which must remain limited to allow for full development . Winter warming in northern and mountainous areas has greatly reduced the risk of mortality, allowing processionary populations to colonize previously unfavourable areas and extend their distribution in latitude and altitude. For example, an unfavourable climatic zone, constituting a barrier, used to exist in the south of the Paris basin. 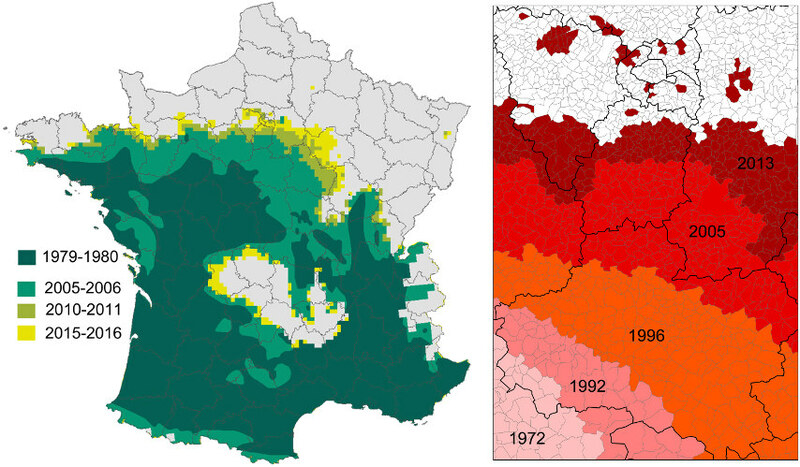 This barrier was lifted in 1996 in direct relation to the increase in winter temperatures and, at the beginning of the 2000s, the entire Paris Basin became favourable to the insect’s establishment, the only limit to its progression being the low flying capacity of females . A continuous northward expansion of more than 120 km was observed between 1972 and 2017, at an average speed of 2.6 km per year, with an acceleration to 5.5 km/year since the early 2000s (Figure 2). This expansion in the Paris Basin was concomitant with an average increase in winter temperature of 1.1°C. The same expansion was observed in the other northern regions of France and at altitude (Alps, Pyrenees, Massif Central) as shown by the geo-referenced mapping of the movement of the expansion fronts until 2016 (Figure 2). 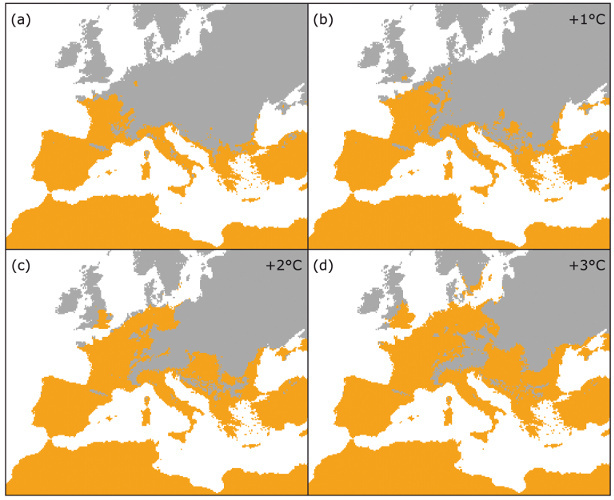 Similar phenomena have been observed throughout southern Europe, from Brittany to Turkey  (Figure 3). These data have made the pine processionary one of the model species for studying the consequences of climate change, selected in France by the Observatoire National sur les Effets du Réchauffement Climatique (bioindicator ONERC since 2006) and internationally by the Intergovernmental Panel on Climate Change (IPCC, cited in the 4th report in 2007). About ten isolated colonies have been successively discovered beyond the expansion front since the mid-2000s in the Paris region (Figure 4) but also in Alsace and Aisne . The distance to the front, between 50 and 300 km, is much greater than the natural dispersal capacities of female butterflies (from a few hundred metres to a few kilometres ). The genetic typing of individuals in these colonies shows that most of them do not originate from the expansion front, but come from populations hundreds of kilometres apart, from southeast and southwestern France, as well as from Italy . In addition, the parasitic complex of these isolated colonies is reduced to pupae parasites. These combined elements suggest a decisive role for humans in the emergence of these colonies through the trade in pines from southern nurseries, with insects travelling as pupae in the soil clods accompanying these pines. The nature of the sites where the colonies appeared, which all correspond to highly anthropized habitats with pines planted for ornamental purposes (highway and roundabouts, cemeteries, factory, university, or low-cost housing estates, etc. ), largely supports this hypothesis. While it is likely that such transport and plantations existed before the 2000s, the unfavourable climatic conditions in the Paris region and in the North did not allow processionaires to settle there. This expansion also leads highly stinging caterpillars to enter peri-urban and urban areas, as well as mountain tourist areas. The first colonies were discovered in 2015 in Paris intramuros, transforming the insect from a forest pest to an urban health nuisance for humans and domestic animals . Battisti A., Stastny M., Netherer S., Robinet C., Schopf A., Roques A., et al. (2005) Expansion of geographic range in pine processionary moth caused by increasing winter temperatures. Ecological Applications 15, 2084-2096. Buffo E., Battisti A., Stastny M., Larsson S. (2007). Temperature as a predictor of survival of the pine processionary moth in the Italian Alps. Agricultural and Forest Entomology 9, 65–72. Robinet C., Baier P., Pennerstorfer J., Schopf A., Roques A. (2007). Modelling the effects of climate change on the potential feeding activity of Thaumetopoea pityocampa (Den. & Schiff.) (Lep., Notodontidae) in France. Global Ecology and Biogeography 16, 46-471. Roques A., Rousselet J., Avci M., Avtzis D. N., Basso A. et al. (2015) Climate warming and past and present distribution of the processionary moths (Thaumetopoea spp.) in Europe, Asia Minor and North Africa. pp 81-162 In Roques A. (Ed.) Processionary Moths and Climate Change: An Update. Springer/ Quae. Battisti A., Avci M., Avtzis D.N., Ben Jamaa M.L., Beradi L. (2015). Natural History of the Processionary Moths (Thaumetopoea spp. ): New Insights in Relation to Climate Change. pp. 15-79 In Roques A. (Ed.) Processionary Moths and Climate Change: An Update. Springer/ Quae. Robinet C, Imbert C.E., Rousselet J., Sauvard D., Garcia J., et al. (2012). Warming up combined with the trade of large trees allowed long-distance jumps of pine processionary moth in Europe. 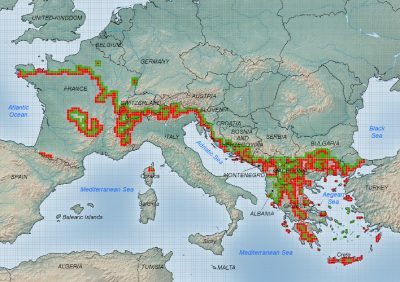 Biological Invasions 14, 1557–1569. Moneo I., Battisti A., Dufour B., Garcia-Ortiz J.C., González-Muñoz M. et al. (2015). Medical and veterinary impact of the urticating processionary larvae. pp. 359- 410 In Roques A. (Ed.) Processionary Moths and Climate Change: An Update. Springer/ Quae.